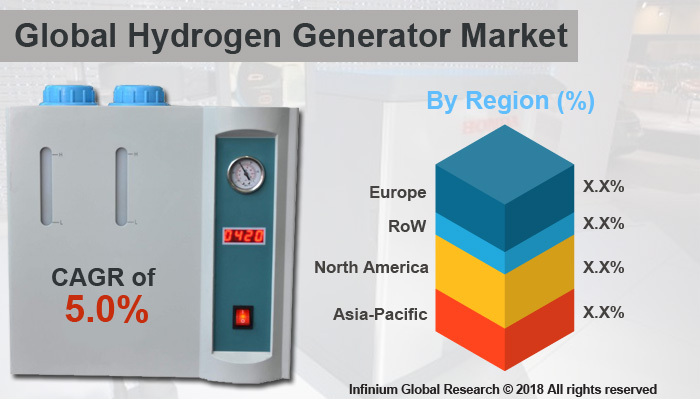 A recent report published by Infinium Global Research on hydrogen generator market provides in-depth analysis of segments and sub-segments in global as well as regional hydrogen generator market. The study also highlights the impact of drivers, restraints and macro indicators on the global and regional hydrogen generator market over the short term as well as long term. The report is a comprehensive presentation of trends, forecast and dollar values of global hydrogen generator market. According to the report the global hydrogen generator market is projected to grow at a CAGR of 5% over the forecast period of 2018-2024. Hydrogen Generator is a device in which the electrochemical reaction takes place – electrolysis of water. It is long been known process of obtaining hydrogen and oxygen gas. The hydrogen generator is the unit that produces hydrogen that is mainly used in the as part of fuel efficiency systems and medical and research fields to produce high purity hydrogen for gas chromatography, nanotube research, semiconductor industry, and many others. The rapidly growing adoption of clean-burning fuels is the major factor that drives the growth of the hydrogen generator market. The hydrogen is used as an alternative to the fossil fuels that helps to reduce the emission of carbon. The growing use of hydrogen as an alternative fuel to the approximately 30% reduction in the consumption of conventional fossil fuel. The high demand for low carbon emission gases from the oil and gas, chemical, automotive and others are anticipated to escalate the growth of hydrogen generator market. The rapidly growing adoption of hydrogen the growth of the hydrogen generator market. Moreover, increasing technological advancements, growing government inclination towards fuel cells electric vehicles (FCEV), and the use of hydrogen generators in the food and beverage industries to remove harmful bacteria’s are the factors projected to create the several opportunities for the hydrogen generator market over the forecast period. Among the geographies, North America region has the highest market share in the hydrogen generator market in 2017 and is expected to maintain its stronghold over the forecast period. The rising awareness about the clean fuels in the North America region led to the high demand for hydrogen power generation plants that are driving the growth of the hydrogen generator market in this region. The report on the global hydrogen generator market covers segments such as product type, capacity, process type, and application. On the basis of product type, the global hydrogen generator market is categorized into on-site generation and portable. On the basis of capacity, the global hydrogen generator market is categorized into 1-100 w, 100-300 w, 300-700w, 700w-1 kW, 1-3kw and 3kw and above. On the basis of process type, the global hydrogen generator market is categorized into steam reformer and electrolysis. On the basis of application, the global hydrogen generator market is categorized into chemical processing, petroleum recovery, refining and fuel cells. The report provides profiles of the companies in the global hydrogen generator market such as Air Liquide S.A., Praxair Technology, Inc, Air Products and Chemicals, Inc., Proton On Site, Inc, Hy9 Corporation, Hydrogenics Corporation, Idroenergy srl., McPhy Energy S.A., and Linde AG. The report provides deep insights on demand forecasts, market trends, and micro and macro indicators. In addition, this report provides insights into the factors that are driving and restraining the global hydrogen generator market. Moreover, IGR-Growth Matrix analysis given in the report brings insight into the investment areas that existing or new market players can consider. The report provides insights into the market using analytical tools such as Porter's five forces analysis and DRO analysis of hydrogen generator market. Moreover, the study highlights current market trends and provides forecast from 2018-2024. We also have highlighted future trends in the hydrogen generator market that will impact the demand during the forecast period. Moreover, the competitive analysis given in each regional market brings insight into the market share of the leading players. This report will help manufacturers, suppliers, and distributors of the hydrogen generator market to understand the present and future trends in this market and formulate their strategies accordingly.